Exceptional user experiences are rooted deep in cognitive and behavioral psychology. A deeper understanding of the psychology behind your users' decisions can help you build more powerful, engaging, and effective user onboarding experiences. The closer we get to reaching a goal, the harder we work to complete it. Think about the second wind you get after reaching the midpoint of a race or the feeling of excitement you experience when you're about to beat a high score. As it turns out, whether or not we're actually making progress is irrelevant—even the illusion of progress toward a goal can encourage us to push to reach a goal faster. This is known as the goal gradient effect (aka the goal gradient hypothesis). Many products take advantage of this human tendency by using progress bars or checklists. Helping users get started—whether through artificial accomplishments (like with a pre-stamped coffee card, to give a real-world example) or real progress toward a goal—significantly increases the likelihood that they will complete a given task. Showing users a progress bar with a substantial percentage already completed helps users feel like they've already made some progress and are not starting from scratch. This further motivates them to complete the task at hand, whether that's a signup form or an onboarding tutorial. Take the question-and-answer website Quora, for example. When they onboard new users, Quora briskly asks them to create an account and verify their email address. Once this is done, it shows them a progress bar that is already 40% completed. Thanks to the goal gradient effect, users are far less likely to abandon the signup process when they see this upfront progress. The speak-easy effect is really just another term for familiarity bias (or the familiarity heuristic). Humans innately prefer things we're familiar with whether they're words, products, or experiences. This principle works in reverse, too: We associate new experiences or words with risk and uncertainty. When the things that a company or product tells us feels familiar, we trust that it's true and that they have our best interests in mind, increasing the likelihood that we'll follow a direction or complete an assigned task. People tend to trust words that are easy to read more than complicated phrases. For example, one study showed that people rated food additives as more harmful when their names were more difficult to pronounce. Keeping UX copy concise helps build trust—always use the fewest words possible to convey meaning. 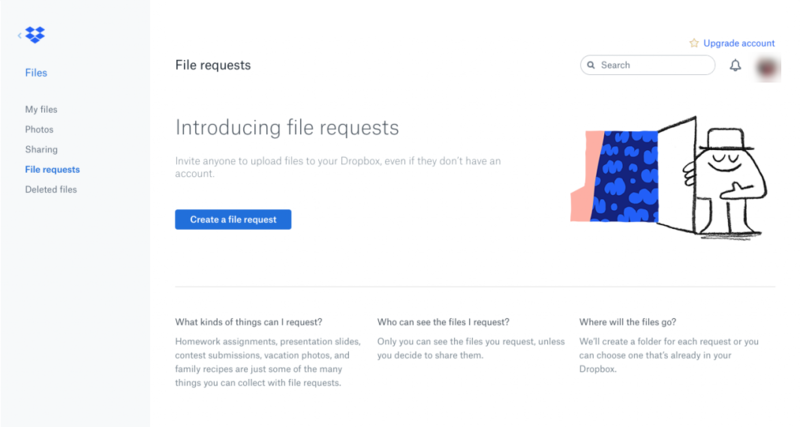 Dropbox does a great job of simplifying their microcopy, explaining each step of their onboarding process and app without overwhelming users. Dropbox Paper adds a human element to their copy by populating their empty states with witty prompts and sample headlines each time a user creates a new document. It's a small touch, but it helps build familiarity and trust in the product and brand. Say I give you a gift and tell you it's yours to keep. Then I say you can trade your gift with someone else. Do you want to keep the gift because it's “yours” even though I only just gave it to you? Or what if you inherited property that you'd never seen from a distant relative across the country: Would you care how the lawn was landscaped or what color the shutters were painted? If you answered yes to either question, you're not alone. The tendency to ascribe value to products that people think they own is known as the endowment effect. Adding some aspect of customer-owned personalization to your onboarding can drastically improve onboarding completion rates. 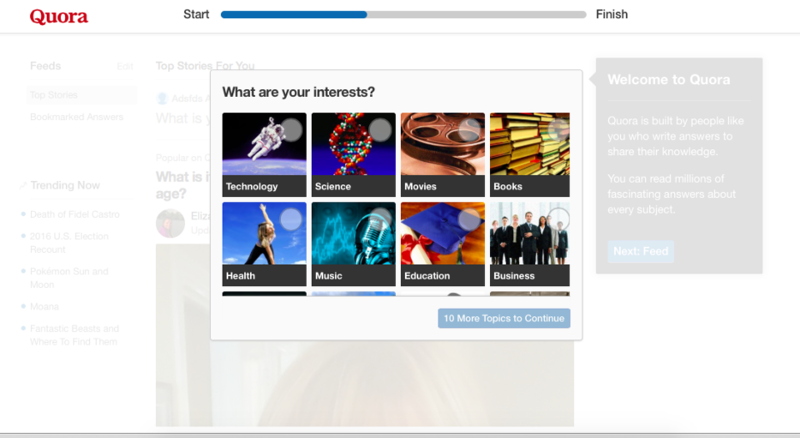 Look for ways to customize the user experience or provide personalization options early in your user onboarding flow. This helps users to begin attributing value to your product early, creating an emotional connection with your app and increasing the likelihood they'll continue (or start) paying for your product. 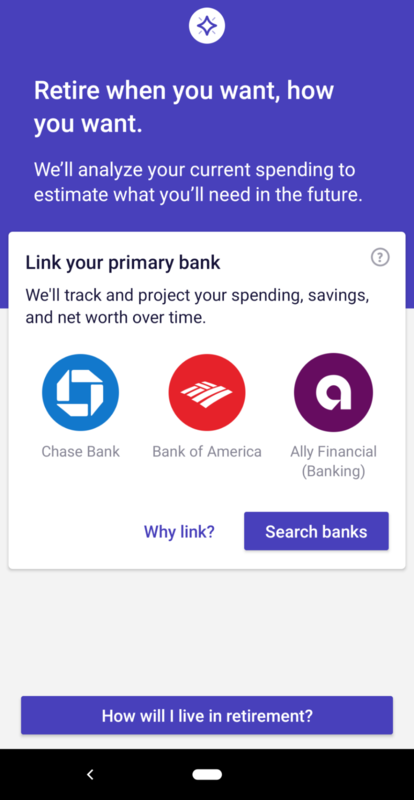 Wealthfront's mobile investment app is an example of personalization done well: Not only does Wealthfront ask personalizing questions early on, but they also use the answers to customize moments of friction (like linking bank accounts) to put users at ease and remind them of their personal motivations. By adding personal details and customizing their preferences, users make the Wealthfront app “theirs” and are more likely to place a higher value throughout their experience. If you've ever felt overwhelmed by a restaurant menu with too many options, you've suffered from the paradox of choice. The choice paradox occurs as the number of choices we're offered grows and we start to become overwhelmed and overloaded. Making a decision becomes difficult or impossible. Not only do we feel mentally exhausted after choosing between many different options, it also leaves us with the feeling that we could have made a better choice or that we missed something important. TurboTax does a great job of removing irrelevant options from the complicated process of filing tax returns. When filling out a tax return by hand, it's nearly impossible to know which sections of the pages and pages of forms are relevant to your personal tax situation. 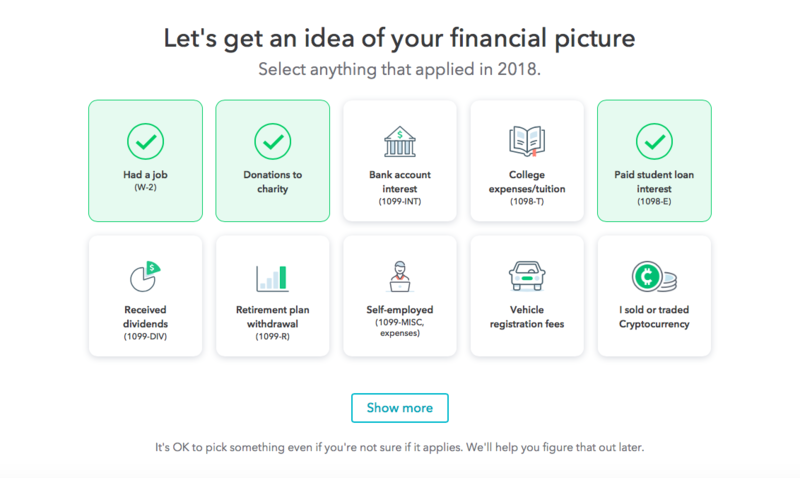 By asking a few simple questions about a user's personal situation, TurboTax is able to eliminate a significant portion of the tax filing process that relevant. This reduction of choice keeps users from feeling overwhelmed by the complex process of deciphering the tax code. Another example of a product that is designed to eliminate unnecessary options is Headspace's mobile app. Throughout the user onboarding flow, Headspace keeps its personalizing questions simple, straightforward, and limited. 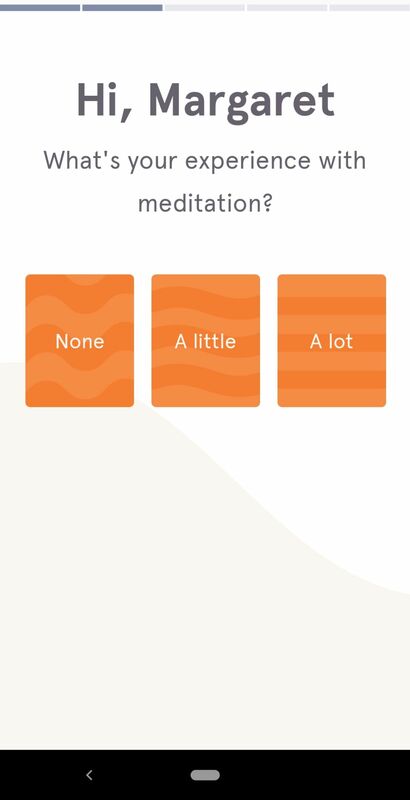 In the screen below, for example, Headspace could have given users more ways to answer a question about their past experience with meditation, but instead they went with 3 broadly applicable choices. The question feels easy to answer as a result, and helps users move more quickly through the onboarding flow. Be prescriptive with the choices you offer users—don't ask 20 questions when you could ask 5. Your interface will be simpler and your users happier for it. The Zeigarnik effect, named for the Soviet psychologist who studied the phenomenon, refers to the human tendency to focus more on uncompleted tasks than completed ones. The psychological tension provided by an incomplete state helps us recall any relevant information we might need to complete the task. The blogging platform Ghost dug into their own data and realized that new users who accomplish a certain task were 10x more likely to subscribe to a paid account than those who don’t. Surprisingly enough, that task was not publishing a blog post—it was adding a custom blog theme. When they discovered this data, Ghost created a simple onboarding sequence that included directing users to add a custom theme. Ghost also sent a lifecycle email to users who had not yet added a theme. They found that 26% of users who opened the lifecycle email and viewed the attached tutorial video added a custom theme, compared to 7% of new users overall. By orienting a critical aha moment as an incomplete task, Ghost drove more users to take action—and ultimately convert into paying accounts. People remember experiences as a series of particularly strong moments, almost like mental snapshots. While we tend to average our experience of events, the most intense moments and the final moments of an experience are weighted more heavily in that average. This is known as the peak-end rule, and it's something product designers can take advantage of when offboarding—yes, offboarding—churning users. Because some folks will inevitably leave your product, and it's up to you to make a good last impression. 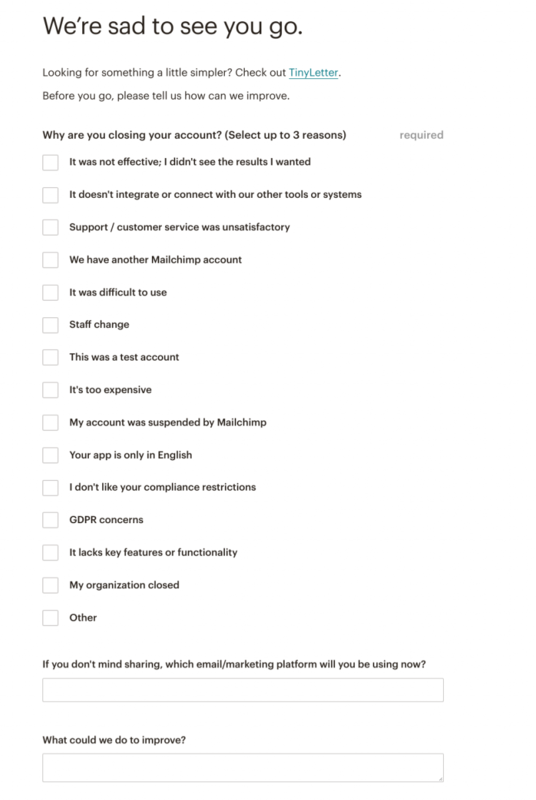 Look at how MailChimp does offboarding: They give their users the option of pausing or permanently deleting their accounts (and makes these options easy to find) and include support links explaining how to export data from the account before it's is permanently deleted. The entire process is straightforward and easy to navigate, leaving a lasting positive impression on the user. Small improvements, when applied to the most intense points of the user journey, can have a large positive impact on the overall user experience. And remember, even after a customer has churned, they can still benefit your business through positive reviews, referrals, or even resubscribing in the future. To say humans are complicated would be an understatement. But at the same time, we're remarkably predictable when it comes to certain patterns of behavior. Understanding the psychology behind why your users act the way they do allows you to design more effective—and enjoyable—product experiences.